We all know that dogs love to chew, but no one ever thinks about elk antlers for dogs. Doing so helps support healthy teeth and gums by removing plaque – making it the doggy equivalent of us brushing our teeth! The activity can also be very relaxing, helping your furry friend to stay calm, or deal with stressful situations. If you don’t want your shoes and furniture to be subject to the wrath of your dog’s teeth, buying them a chew toy is a must! One classic option is to get your dog a bone, but more and more vets are now suggesting that this could actually be quite dangerous for your pooch. Bones are much harder than other chewing options, meaning they have the potential to break your pet’s tooth, which can be very painful! A broken tooth will often result in its complete removal, not to mention the vet’s fees. Bones also have the potential to splinter, and if your dog swallows a piece all sorts of nasty complaints could ensure. The solution? Elk antlers for dogs. Just like bones, they’re hard enough to last through a considerable amount of chewing and contain the tasty marrow that dogs love. They’re also a little softer than most animal bones, and less likely to splinter. Antlers could be the natural alternative to bones you’ve been looking for, and there are plenty to choose from! Below we go through our top ten and answer some common question about these doggy treats. Big Dog offer pets and owners a great quality natural product. Their “Happy Dog Guarantee” ensures your pooch is happy with their new chew, or your money back. Each of their antler pieces is at least six inches in length, and solid enough to stand up to some serious chewing! Ideal for medium and large sized dogs, the antlers are sourced from wild deer and elk. They’re totally natural too – Big Dog’s antler chews are never treated with chemicals or artificial preservatives. Each piece has been expertly cut, trimmed, and sanded, to make them safe and comfortable for your dog to chew. These antlers will never leave a greasy residue on your floor, and each is a great source of multiple vitamins and minerals for your dog, including calcium, manganese, and zinc. White Tail Natrual’s antler chews help to keep your pet’s teeth healthy without odor or mess. Each piece is safe for dogs to chew, and, unlike bones, won’t splinter. These long lasting chews have been cut and trimmed for maximum safety, and each is around five inches in length, making them the perfect option for medium sized dogs. They’re sourced and prepared in the USA, too, to a very high quality. They’re totally free from artificial additives, and full of vitamins and minerals dogs need. For particularly large dogs, there’s Heartland Antlers. Each piece is seven to nine inches in length, and expertly selected and trimmed. The chews consist of premium elk antlers – the top 15% in terms of quality – and are never treated with any artificial additives or preservatives. These A graded antlers can be recognized by their darker coloration, which indicates minimal drying and bleaching. The antlers are also sourced and trimmed in the USA, from wild elk. Because of their hefty size and great quality, these are some of the longest-lasting antlers on the market. These antlers are a great way to help maintain the health of your dog’s teeth naturally. Each of these antler pieces is a huge seven to 14 inches long, making them another great option for the largest of our canine friends. They’re made from the antlers of wild elk, and sourced from the USA. Each antler is grade-A quality, too, minimizing any loss of minerals or hardness through weathering. They last for much longer than similar products, such as pig hides and bully sticks, without posing the risk of splintering that bones do. Each piece is carefully trimmed to ensure splinters don’t break off and potentially damage your dog’s mouth or digestive tract. These antlers are shed by elk naturally, before being picked up and treated by experts. Their excellent quality makes them a great source of many vital vitamins and minerals including calcium, which helps to support healthy bones and teeth. These antlers are cut to suit our medium sized pooch pals. Each is between five and eight inches in length; recommended for dogs who weigh around 20 to 45 pounds. Like the other antler chews on this list, each is made from grade-A quality elk antler, carefully trimmed to avoid any nasty splintering. They’re also sanded, just to be on the safe side. Sourced in the USA, these antlers are a great natural alternative to artificially manufactured chews. Since, unlike bones, they won’t leave smears of grease around your home, they’re perfect for indoor as well as outdoor use. Your canine companion will be occupied for hours on end with this high quality chew, which also helps promote healthy bones and teeth. Pound’s pack comes with three to five antler pieces, each of which is at least six inches in length – perfect for medium to large sized dogs. The antlers are totally natural; not treated with any artificial additives or preservatives. Each piece has been carefully selected, and grade-A quality antlers only make it into pound’s final product. They’re also cut to size, trimmed, and sanded to minimize the possibility of splintering and keeping your dog’s mouth and digestive tract safe. The antlers are incredibly long-lasting too – each can take as much as three months for a dog to gnaw their way through. They’re also a great price for their quality, and help provide your dog with a whole host of vitamins and minerals, like all good quality antlers. Customers report that their dogs love the taste. This might just be the perfect pack for households with multiple dogs. Top Dog’s antler chew set comes with a variety of shapes and sizes, ensuring there’s a shape and length for pooches both great and small. They’re all sourced from wild moose, deer, and elk in the USA, and only use high quality antlers which have been naturally shed. Each piece is carefully inspected to comply with FDA regulations, so you can give one to your dog safe in the knowledge that they’re as safe as possible. The antlers are also free from any additives or preservatives. They’re tough enough to be a great option for hard chewers, and contain multiple nutrients which are a healthy addition to your dog’s balanced diet. Buck Bone Organics pride themselves on responsibly sourcing all the ingredients of their products from natural sources, and this is no different when it comes to their antler chews. Each is naturally shed from wild elk in the USA, and carefully selected by experts. Their large chews are between six and seven inches in length, and the perfect size for medium to large sized dogs including German Shepherds and Labradors. Other sizes are available too, though, with differing densities designed to be right for different sized mouths. The antlers are always cut and trimmed by hand, ensuring they’re the best possible quality by the time they reach your pooch. Only grade-A quality antlers are used, and the chews offer dogs a selection of vital vitamins without upsetting sensitive stomachs. They’re free from gluten, as well as any additives or preservatives. For dogs weighing 30 pounds or more, this chew is a great option. Earning their second spot on our list, Elkhorn Premium Chews crafted this chew carefully, using only grade-A quality elk antlers, sourced and made in the USA. Each chew is seven to nine inches in length, and hard enough to be the perfect choice for aggressive chewers. It’s also what’s called a “split” chew. This means the antler has been cut in half, and allows dogs to access the tasty marrow inside more easily. This can be useful for overly enthusiastic dogs who might otherwise be liable to hurt their teeth as they impatiently chew their way towards the marrow inside a standard antler. Another brand to earn the coveted two spots on our list is White Tail Naturals. Their three pack of antler chews offers dogs an odor and mess-free way to improve the health of their teeth and gums. Each piece is hand selected, cut, and trimmed for maximum safety, and is the perfect nutritious chew for medium sized dogs. Each chew is between five and six inches in length. Crafted and sourced from wild elk in the USA, these chews are a long lasting and natural chew option, which is totally free from additives and preservatives. There are certainly tons of products out there that are produced for dogs to chew on. They are typically made of various materials and dog owners can choose which one is most suitable for their pets. 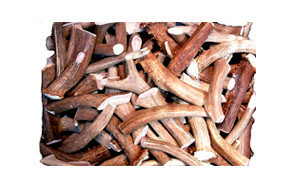 One of the best options out there is antler chews because they bring a lot of health benefits and are also safe. We hope that one of these chews will be the right option for your dog – if they’re an aggressive gnawer, elk antlers for dogs really can be a long lasting solution which is good for them too! Like antlers themselves, elk antler chews come in all shapes and sizes, as well as different levels of harness, and differing qualities. Because of this, the task of picking one out for your dog can be surprisingly challenging! That’s why we’ve covered some of the most common questions and concerns about these products, so you’re in the know when it comes to what your furry friend is gnawing on. When selecting an antler chew for your pooch, quality should be at the top of your list. This is a product which your pet will be gnawing on for hours and ingesting, so it’s important to choose the best ones! We recommend purchasing a chew with a grade-A quality rating. These can cost a little more, but since they last longer, it’s definitely a sound investment. Better quality chews also retain their vital vitamins and minerals better, so are more nutritious too. 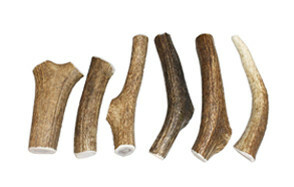 Antler chews are generally considered by veterinarians to be much safer for dogs than bones, but the best manufacturers render them safer still by cutting them to appropriate sizes, and trimming and sanding them into smoothness. This treatment helps to prevent splinters breaking off, which could cut your dog’s mouth, or become lodged in their digestive tract. It probably goes without saying, but if you’ve got a big dog, you’ll need a big chew. Most antler chew manufacturers will provide advice concerning the size of dog they are intended for, and roughly how long the antler pieces are. A dog’s chew should be too large to be accidentally swallowed, so as to avoid a choking hazard. Some manufacturers will indicate how hard their chews are, which can be really useful for owners. If your dog has never had an antler chew before, it’s a good idea to start them out with as soft a chew as possible. If this is worn down too quickly, move onto a medium hardness. Although it might annoy dog owners when their pups chew everything in sight, including their own shoes and socks, it is actually quite a normal behavior for them. Chewing is vital for oral health and allows them to use up energy. Moreover, it keeps them from doing other destructive things and leads to them being content because chewing allows positive brain chemicals to be released. Dogs feel less anxious or frustrated when they chew. Dogs learn about the world around them through chewing, especially when they are still puppies. Like babies, biting on something relieves them from teething pain. Older dogs, on the other hand, clean their teeth and keep their jaws strong by gnawing on something. Antlers as dog chews have been a long-term practice though it has recently become more popular. Other than elk, deer are also sources of antler chews for canines. Antlers start off as layers of cartilage that eventually turn into bone. They grow about 1 inch every day. Antler velvet, which is a thick layer of fur, grows and elk rub this off on the antlers. After growing fully, these antlers are shed naturally. While there are many kinds of antler to choose from, elk antler is the best. The differences are in the sponginess and hardness of the antler, with deer horns too hard and most likely to cause dental injuries. Moose and mule varieties, on the other hand, are also safe for dogs to chew on but are not as easy to find as those from elk. Moreover, these antlers open up in the middle so canine chewers get easy access to the bone marrow. However, these split antlers will not last as long especially if you have an aggressive canine chewer. Elk has the right density and does not have as high a risk of slap fractures like other options. Antlers contain real bone and cartilage, as well as a marrow core. Because they are actually bones, they are very hard. Unlike rawhide or processed bones, they contain calcium, protein, collagen, glucosamine, magnesium, chondroitin sulfate, as well as iron and zinc. Raw-fed dogs need bones for a balanced diet, though they do not have to be very hard ones like elk antler. However big or small your dog is, 100% natural elk antler is the best option for your pet. They are great at keeping teeth clean and strong. They are also good for puppies, as well as both small and big dogs. Here is a rundown of the benefits of opting for this type of dog chew. They last a long time and do not easily chip, splinter, or split. They are non-allergenic and in fact, do wonders for your pup’s coat. They come from a natural source and because elk shed them, there is no harm caused to them. At the same time, they do not have any artificial ingredients that might be harmful. Antlers have more nutritional value than other chews. These types of chews are also mess-free, unlike rawhide. It’s difficult to find a chew this rich in these important nutrients which is also totally natural. Antlers are also free from gluten, and artificial additives, which makes them a great chew option for dogs with sensitive stomachs or allergies. Grade A+ are the highest quality products and are also very pristine, so they are normally used for crafts or artisan purposes. Less than 5% of antlers are graded A+ and they are quite tough to find. Grade A antlers comprise of 10 to 15% of products yearly, and they have been shed during the same or the previous year. They look a bit light brown in color as a sign that they have been freshly shed and have not been exposed to the elements a lot. Grade B antlers are the most plentiful in the market, under high-end brands. They look white because they have been dried through sun bleaching. They might also have signs of rodent chewing. These antlers were shed about 1 to 2 years before. Unfortunately, they might not always be safe for your pup to chew on, as the drying out process might make them much more likely to chip or splinter. Lastly, Grades C and D antlers are the least appropriate for your pet. They look white due to many years of exposure to the sun and the elements, and you might notice a white powder on the surface. Because it has lost a lot of moisture, it looks porous. They will break easily, and you have to watch out because they are sold in many pet stores out there as dog chews. Deer and elk antlers contain comparable levels of nutrients and are both suitable chews for many dogs. The main difference between them is that the outer core of deer antlers is much harder than that of their elk-sourced counterparts. Because of this, whether you choose to give your dog a deer or elk antler will depend very much on their chewing style. Dogs with sturdy jaws who chew aggressively may be better off with deer antlers since they’ll last through the constant gnawing for much longer – meaning fewer replacements for you to buy! Conversely, dogs who do not chew so aggressively will probably benefit from the softer exterior of elk antlers. When trying your dog with an antler chew for the first time, it’s a good idea to start with elk, even if you’re not convinced it will last for very long! Chews that are too hard can be dangerous for dogs, so it’s best to err on the side of caution if in doubt. As with other types of dog chews, you should make sure that the antler chew is big enough for your pup not to choke on it. You should also make sure that there are no sharp edges at all times. If you find one, you can simply smoothen it out with sandpaper or just rub it against concrete. Most importantly, limit your dog’s chewing of antler to one-half to 1 inch every day. The high protein content of antler might lead to upset stomach so monitor it when it is chewing, if possible. It is also possible for your pup to develop a weight problem if you feed it too much as well. When buying elk antler, make sure that you consider the type of chewer your dog is and its current state of dental health. If your dog has had loose teeth, fractures or breakages, this will rule out any hard chews for them. Moreover, if they have smaller teeth and jaws, then they only need a softer chew. Dogs also suffer oral health issues like gum disease, gingivitis, bone loss, and periodontitis. These issues will make antler chews unsuitable for your pup. You can consult with the vet on the best kind of chew for your pet if you are unsure. Should you decide to give antler chews, look carefully for good quality products and check the grade of the product you are planning to buy. Finding any blood on the antler is a sign you need to watch out for. He might have a wound caused by the chewing, or it might have a split so make sure to check the antler and treat the wound accordingly. Antler chews are great options for a dog that loves chewing, so long as it has excellent oral health. While they are a safe and natural choice for your dog, it is important for dog owners to know how to find the best antler chews for their dog and what to watch out for. Q: Where do elk antlers for dogs come from? A: Elk and deer antler dog chews are completely natural products, which the animals naturally shed roughly every year. This frequent shedding typically takes between two and three weeks, and allows the animal to grow new, stronger antlers. The new growth cycle takes two or three months to complete. Deer and elk will simply leave their discarded antlers lying around – they have no further use for them. Dogs, however, do. Companies who produce antler chews source them by having expert gatherers scour areas where deer and elk live, looking for these shed antlers. The quality of the antler can be ascertained by its color, since a darker antler indicates it was shed more recently, so has been less bleached by the weather, and retained more nutrients. Since deer and elk shed their antlers every year, they’re also a great renewable resource which is relatively easy to come by. Dogs love to chew antlers because of the honeycombed marrow within them. Q: Are elk antlers for dogs safe for my canine? A: Deer antlers for dogs are not recommended for dogs with weak teeth, and if you’re unsure you should consult with your vet. Generally speaking, however, elk antler chews are safe for dogs, yes. They possess all the benefits of bones, but without the possibility of splintering, plus elk ant, in particular,ular are a slightly softer alternative. Like bones, they contain tasty marrow which harbors a whole host of nutrients from protein to calcium. They also last just as long as bones when chewed aggressively. For dogs with sensitive stomachs, antler chews could even be safer than artificially manufacture red ones, since they’ll never contain any additives or preservatives. To make antlers even safer for dogs, pet care companies will cut them to an appropriate size to prevent choking hazards, trim off any extraneous pieces, and sometimes sand them down too. Making the deer antlers for dogs smoother helps prevent the chew from scratching up the inside of your dog’s mouth. Although they’re generally safe for healthy dogs, be sure to supervise your pooch carefully the first time you give them an antler chew, and perform regular check-ups on their teeth and gums to make sure any dental problems are nipped in the bud. A: Antler burrs or buttons are an alternative way to purchase antler chews for your dog. They actually consist of the part of the deer or elk antler which would have met the animal’s skull. Purchasing burrs is often more economical than choosing a full antler piece, but they may not necessarily be the best option for your dog. This is because the burr is usually the toughest part of the antler. Since its function is to hold the antler onto the animal’s head, burrs need to be this hard in order to stand up to the aggressive behaviors which stags exhibit during mating season. If your dog has never tried an antler chew before, we wouldn’t recommend giving them a burr. These are too hard for many dogs, and suitable for the most aggressive chewers only. When trying a burr for the first time, be sure to closely supervise your dog. 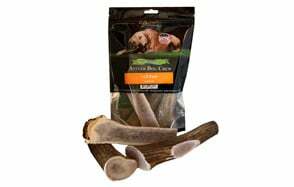 When it comes to finding the best elk antler dog chews, we think that Big Dog have got it right. Their six inch elk antler dog chews are perfect for most medium and large dogs, and are always naturally sourced. We also appreciate the fact that Big Dog always sand their antler products, making them safer for dogs’ mouths than cutting and trimming alone. Their “Happy Dog Guarantee” is another indicator of the faith Big Dog have in their products, which are a great natural alternative to other chews, which dogs really love. We also think they’re great value for money, which has helped to earn them the top spot on our list.